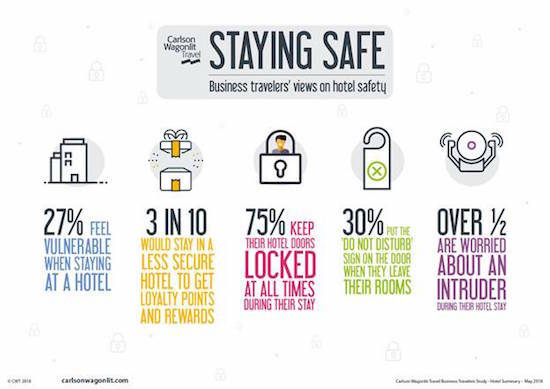 This week, Minneapolis-based Carlson Wagonlit Travel, a global travel management company, released the results of its Safety & Security Study of the booking habits of more than 2,000 business travelers in 17 countries. Among the surprising findings: Three in 10 business travelers globally said they are willing to sacrifice their own safety in order to receive loyalty points or rewards from a hotel. Even more eyebrow-raising is the statistic that 47 percent of business travelers from the United States said they would choose points over personal safety — not necessarily a good win for U.S. road warriors. Similar sentiments were expressed by 41 percent of Brazilian travelers and 34 percent of Canadian travelers. What makes this study even more perplexing is that when business travelers were asked how they felt at hotels when traveling for business, 35 percent of respondents from the U.S. expressed concerns about safety, compared to 25 percent of Canadian travelers and 23 percent of Mexican travelers. This begs the question: Has personal safety become an increasing concern for U.S. business travelers precisely because racking up hotel points trumped safety in their choice of a hotel? A closer look at what is keeping travelers up at night makes one wonder how they accomplish any company business on their trips. More than half (53 percent) of business travelers from the U.S. said the physical location of their hotel alone has made them feel unsafe; 47 percent said they worry about an intruder breaking into their hotel room; 46 percent identified disruptions or actions of other guests as making them feel unsafe, and 37 percent worry that hotel staff might inadvertently give their room key to a stranger. The survey, which analyzed hotel bookings made by CWT business clients who had made more than four business trips during 2017, also gives a glimpse into what kinds of hotels business travelers typically choose. Close to 74 percent of Asia Pacific travelers stayed in 4- and 5-star properties, compared with nearly 60 percent of European travelers. Meanwhile, only 52 percent of business travelers from the Americas (which includes Brazil, Canada, Chile, Mexico and the U.S.) chose anything near a luxury-level hotel. Over 45 percent of travelers from the Americas said they typically stayed at hotels rated as 1- and 2-star properties, compared to 29.8 percent of European travelers and 21.6 percent of their Asia Pacific counterparts. The CWT Safety & Security Study was conducted via the Artemis Strategy Group from Jan. 29 to Feb. 9, 2018. For more details about the study, go here. Hotels Focus on Luring Business TravelersMid-level brands want a piece of the business pie. Kempinski Promises 10 Percent Commission to Third-Party Bookings and 5 Percent on Pre-Booked F&BThe hotel company also will roll out a meeting-planner loyalty program offering "room credits."